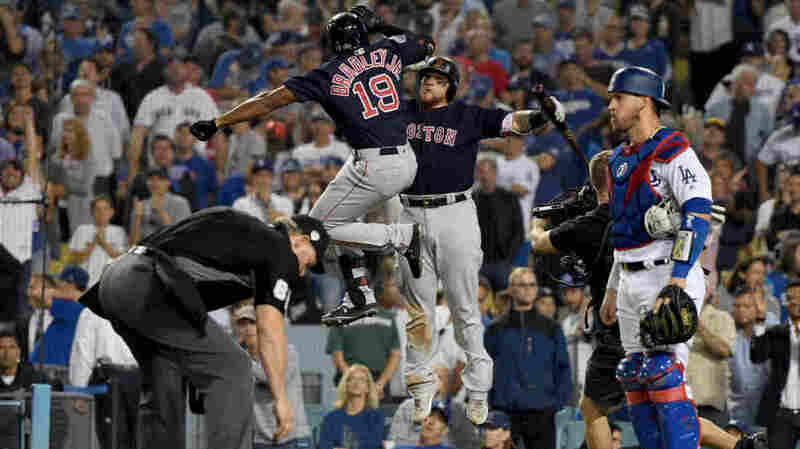 World Series Game 3: Dodgers Defeat Red Sox In 18-Inning Game Dodgers starter Walker Buehler threw seven powerful innings, but Boston outfielder Jackie Bradley Jr.'s solo home run matched Los Angeles' meager production. It took 10 more innings to break the tie. "We can't stop here, this is bat country!" Max Muncy of the Los Angeles Dodgers hits an 18th inning walk-off home run early Saturday on a pitch from Nathan Eovaldi of the Boston Red Sox to win Game Three of the 2018 World Series at Dodger Stadium. There wasn't a doubleheader scheduled for Dodgers Stadium on Friday night, but they played one anyway. And if that wasn't enough baseball for you, Game 4 of the World Series starts in Los Angeles in less than 17 hours (8 p.m. ET, Fox). By that point, Boston had one pitcher left in its bullpen, Los Angeles two. Neither team had a position player left on the bench — which could have triggered true weirdness if the Red Sox's Eduardo Núñez had taken more damage from any of his many extra-innings tumbles and face-plants. 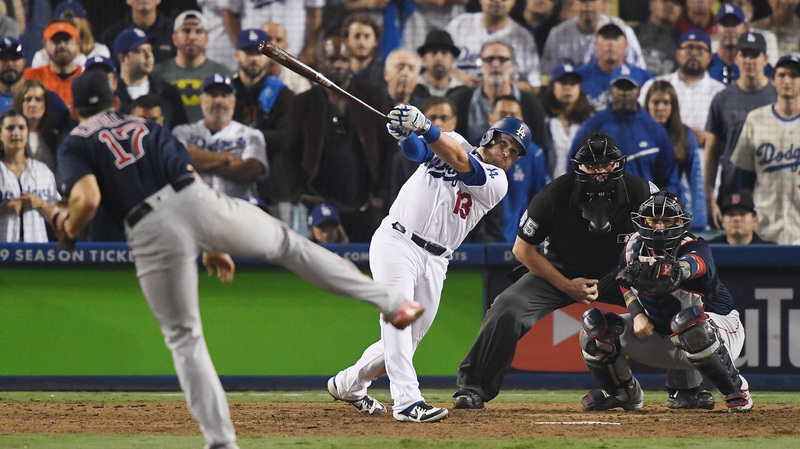 Before Muncy's smash, four innings had passed by with such little action it began to feel as if the game might never end — like a bad pharmaceutical trip out of Fear and Loathing in Las Vegas — especially after the surreal 13th inning. "Buy the ticket, take the ride ... and if it occasionally gets a little heavier than what you had in mind, well ... maybe chalk it up to forced consciousness expansion: Tune in, freak out, get beaten." Austin Barnes of the Dodgers topples Eduardo Nunez of the Red Sox while fielding a wild pitch during the 13th inning. With Boston up, second baseman Brock Holt drew a leadoff walk, then stole second base on a wild pitch by Dodgers pitcher Scott Alexander. As catcher Austin Barnes dug the ball out of the dirt, he flung the Red Sox's Eduardo Núñez — not-really-inadvertently screening Holt's run — over his shoulders, shaking him up. Max Muncy drew a leadoff walk of LA's own, then advanced to second after Núñez crashed into the seats catching a Cody Bellinger foul ball. Yasiel Puig hit a hard grounder up the middle for the Dodgers that Ian Kinsler struggled to handle; he threw the ball well wide of first, and like Holt, Muncy came around to score from second. "In a closed society where everybody's guilty, the only crime is getting caught. In a world of thieves, the only final sin is stupidity." 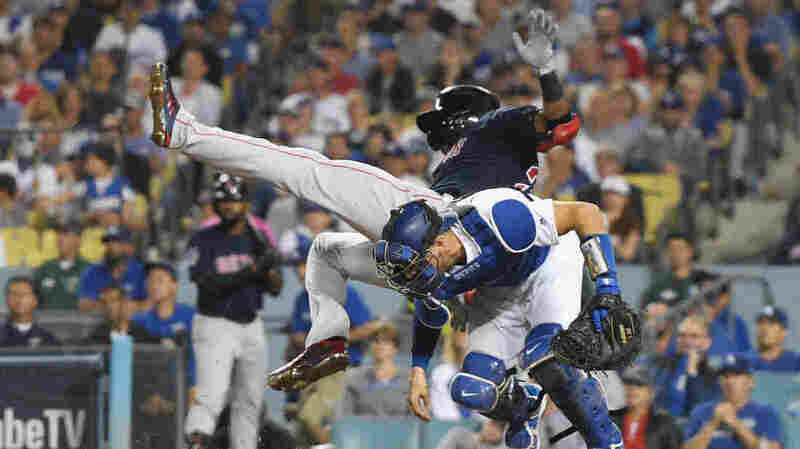 Ian Kinsler of the Boston Red Sox is tagged out at home plate in the 10th inning early Saturday by Austin Barnes of the Los Angeles Dodgers on a throw from outfielder Cody Bellinger. "You can go up on a steep hill in Las Vegas and look West, and with the right kind of eyes you can almost see the high-water mark." Jackie Bradley Jr. of the Boston Red Sox is congratulated by teammate Christian Vazquez on Friday after his eighth inning home run against the Los Angeles Dodgers in Game 3 of the 2018 World Series. The homer tied the game and ultimately sent it into extra innings. But they only managed to get a single run, which means Red Sox outfielder Jackie Bradley Jr.'s eight-inning solo shot off reliever Kenley Jansen effectively erased Buehler's sterling work. "One of God's own prototypes. A high-powered mutant of some kind never even considered for mass production. Too weird to live, and too rare to die." Starting pitcher Walker Buehler of the Los Angeles Dodgers throws against the Boston Red Sox on Friday during the second inning in Game 3 of the World Series in Los Angeles. He threw more than 20 pitches faster than 98 mph in the first three innings. If the Dodgers had trotted out the same lineup as they used in games 1 and 2, they might not have had even that opportunity. Their sole run came on a solo home run by outfielder Joc Pederson off of Red Sox starter Rick Porcello. It was Pederson's fourth home run in his six career World Series starts. 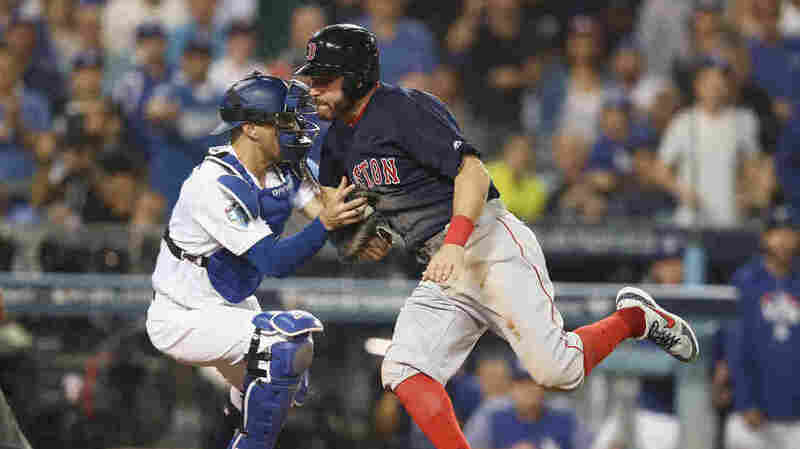 Boston's bullpen, which threw three lockdown innings to choke the life out of the Dodgers in Game 2, has given up four hits and a walk since Porcello left in the fifth inning, but has kept the Dodgers scoreless. It was given an assist in the ninth inning by David Price, who threw six mostly sharp innings on Wednesday as the Red Sox's Game 2 starter. The Los Angeles Dodgers will have a couple of advantages in Game 3 of the World Series on Friday night. To take the title from the Boston Red Sox, they'll need to find a whole lot more. The series shifts to pleasantly warm Los Angeles after two games in Boston's chill — weather that Dodgers reliever Ryan Madson suggested was partly to blame for his poor performance in both games. And they'll face right-handed Red Sox starting pitcher Rick Porcello, which means matchup-happy Dodgers manager Dave Roberts will insert the team's top four home run hitters — back into the starting lineup after they started Games 1 and 2 in the dugout. 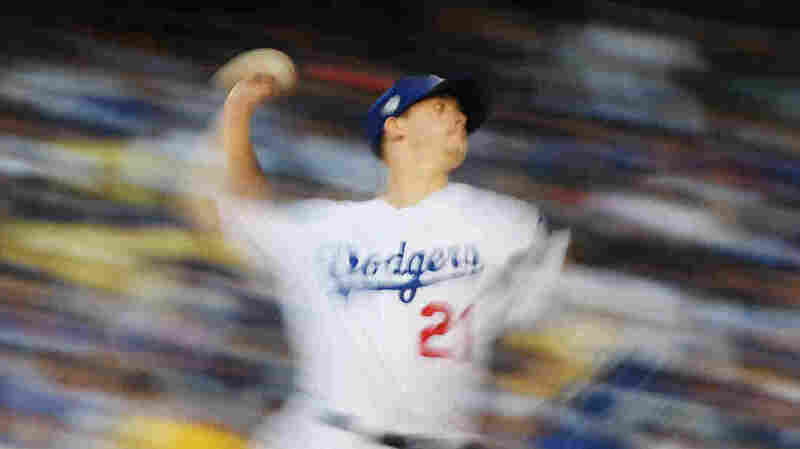 Los Angeles member station KPCC noted that five of the Dodgers' six losses in the postseason have come against left-handed starting pitchers. 16 of the last 17 teams - including 10 straight - went on to win the World Series after taking a 2-0 series lead. And as WBUR's Shira Springer noted to NPR's Newscast, the Red Sox haven't lost a single road game yet this postseason. "Their manager, Alex Cora, has made all the right choices ... every thing, every move, every pitcher he brought in has worked." His move to start Friday's game is to put designated hitter J.D. Martinez in left field, moving Andrew Benintendi to the bench. With the series moving to the National League's home turf, no designated hitters will be used.